What do you need to try out the Internet of Things (IoT Service)? You need a free SAP Cloud Platform developer account (trial instance): Signing Up for a Developer Account. Note: We recommend that you use the Firefox or Chrome Web Browser. How to Subscribe to the IoT Service? Access for trial accounts: https://account.hanatrial.ondemand.com/cockpit. Access for productive accounts: https://account.hana.ondemand.com/cockpit. 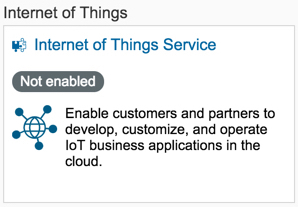 Select the Internet of Things Service entry. A subscription of the IoT Service will be automatically assigned to your account. This subscription includes Remote Device Management Service (including IoT Cockpit) and Message Management Service capabilities. The “IoT-User” role is automatically assigned to your user. The role is required to access the Internet of Things Services Cockpit. The Internet of Things services Cockpit allows you to register devices in a secure manner. Every device must have a certain device type which is specified by its supported message types. You can define both types in the IoT Cockpit as well. Choose Go to Service for the Internet of Things services subscription. The Internet of Things Service Cockpit is displayed. The deployment of the Message Management Service (MMS) is necessary to be able to send data from a device to your consumer account. Go to the Internet of Things Service Cockpit. Choose the Deploy Message Management Service tile which opens the MMS deployment tooling. Fill in the target consumer Account ID (pre-filled) from the SAP Cloud Platform Cockpit, and enter your User Name (pre-filled) and Password. You can now start creating Message Types, Device Types and Devices in the Internet of Things Services Cockpit and send data from a device. The following section describes an example. How to connect my first device? 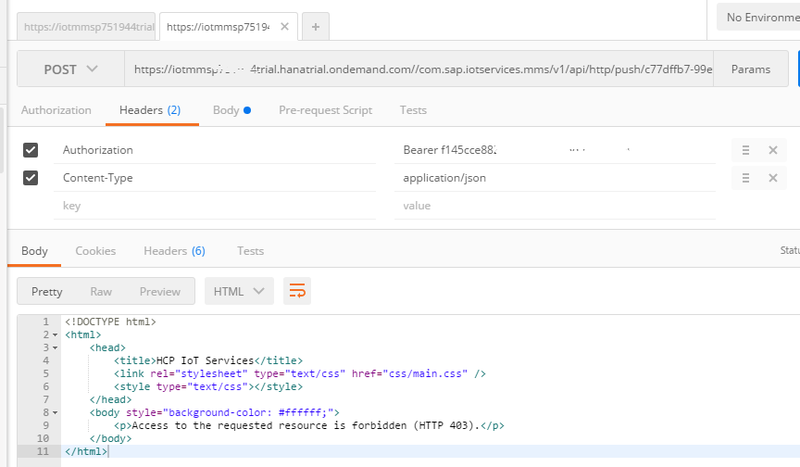 The Starter Kit for the SAP Cloud Platform IoT Services includes a documentation, and code snippets, which provide a complete end-to-end example of how to use the IoT services. You will learn how to enable the services as well as how to send messages and how to receive push messages. Moreover, a sample data consumption UI is provided. Further tutorials and blogs can be found on our SAP Cloud Platform IoT Service Jump Page. We highly appreciate your questions or feedback. Please add your comments below. Furthermore we have a section FAQ in the documentation with a collection of frequently asked questions and provided solutions. Additionally, you can keep yourself up to date by visiting the Release Notes page for the SAP HANA Cloud Platform, Internet of Things services regularly. -> When I try to deploy MMS, I have a message 409 or 403 when I enter my credentials. can you check if you have stopped any existing JAVA application which is running in your trial account . and once the iotmms is running do not forget to assign role to your user. It seems I had a problem with my credentials. is it possible to analyse the incoming data directly? Or is it necessary to poll the data with an external application and trigger events from outside? Can i see the sources somewhere? Currently you need to work on the data directly. An example how to consume the data is described in the Starter Kit for the SAP HANA Cloud Platform Internet of Things (IoT) Services. There you will find even a sample Java Application for the consumption of the acquired data (Basic Consumption and User Interface Alternatives). I have problems with github part. I do not know how to implement the chapter ” Code snippets for IoT Devices” with Python files. Is there any place where I could find more detailed instruction how to cope with github and the files? A kind of step-by-step instruction. You can use your web browser to go to the GitHub pages at SAP/iot-starterkit · GitHub. If you are not familiar with a git IDE or command line client – you may either want to use the “Download ZIP” button for the whole repository content or follow the links (starting with src) in the upper section till you finally reach the code snippets or the 2 .py files (program and config) of an integrated example. In addition to code for a Raspberry Pi there is an integrated example (simulating an IoT Device) for usage on your PC or Mac that you may want to start with. To use it, just install Python (e.g. from Welcome to Python.org) and urllib3 (e.g. with the pip package manager that comes with the Python installation: pip install urllib3). The integrated example (that makes use of the listed code snippets) shows you how the APIs for interacting with the HCP IoT Services are used. If you are more comfortable with e.g. Java, just have a look at which GET / POST requests via https are made – and do the same with Java. Hope that helps. Thank you for the suggestions. I will try them. In case I still have problems, I will get back. As you mentioned above I successfully installed Message management Service and assigned role to user. Successfully installed Message management service like below. Assigned IoT-User Role to User like below. Similarly I assigned IoT-MMS-User role to the user like below. But when I am accessing the Java application I am getting the below error message. I think you have to give your user id instead of demouser. Try this. I tried with User ID. It’s working fine. I am facing the same issue. I have tried giving my User ID, but still the error persists. In the code snippet insert.py, how do I specify the device ID ? I have never done this. Could you please help ? I checked the device ID as well as the OAUTH token several times. I even recreated another device. Unfortunately it does not work either. Can anybody help?? can you please print out the raw message that causes this (by adding a print statement in the Python code). and check whether the “warning” disappears. The root cause for it will be fixed. thank you so much for the immediate reply. I tried your proposed solution but the warning unfortunately does not disappear. Am I on the right paths? I set up the application as explained on GitHub. Yet, it seems the table used for storing messages (and which follows the naming conventiion T_IOT_<DeviceTypeID>_<MessageTypeID>) are not created. a table T_IOT_<device_type_id>_<message_type_id> will be only created after you sent some data to MMS on behalf of the respective Device. You may use the sample HTTP client available in MMS or a python script from the Starter Kit, for example. After a first attempt (RDMS needed to be synchronized? ), the message went through. Oups, didn’t use the right “simple HTTP client” And now the table is populated. Can you give me the code ? I want to program a JAVA application with IOT service,but I can’t understand the code from Github. So,I want to refer to your code.Can you help me ? I’m trying to get this example running in node.js using the websocket node.js library. I’ve checked the device ID in the URL and the OAuth token is correct. I ran the Python websocket sample and I get the same result. The same code going against HTTP instead of websocket works fine so the problem seems to be specific to websocket interface. thanks for the hint. There was a bug we fixed in the current dev version already. The new release (1.1) will be available next week. I have an issue on the Rapsberry side. The only change I made in your code is about the sensor (I plug the temperature sensor). I have an error message saying that urllib3 is not able to send the data in https. It doesn’t come form the network because I’m able to ping google from the raspberry but it could come from the last release of urllib3 (I saw some forum post about issues with HTTPS). let’s check the connectivity first. Did you configure (in your config.py) a proxy or are you working without one? You may also try to use wget or a browser to check whether you can access the service URL. This will give you an authorization error (because you don’t use the OAuth token this way) – but at least you can check whether the target URL is reachable. Finally, if you have a monitor connected to your Pi or login via ssh with X forwarding – you can also run the Python desktop simulator examples. Feel free to get back to me if you keep stuck. Hi Sadanand, if you do not have or know your SCN password, please select “Cancel” when the client authentication pop-up window appears or use another browser (without certificates imported), this will show you a logon page where you can reset your password. I have written a python script for continuously polling the MMS for recieving input to device. If polling occurs then the MMS stalls, that is the PUSH does not work at all. I am using POSTMAN for testing the same. However, all I get is service unavaialbe. which URL exactly you try? It should be your tenant specific. I just checked the https://iotrdmsiotservices-<USER_ID>trial.hanatrial.ondemand.com/com.sap.iotservices.dms/api/devices (<USER_ID> is your P-user) and it worked. Hi Joseph, can you pls try to clear the browser cache or open the page in incognito window? I have already done it many times. Could you please check if the error still occurs for you? Still the same 🙁 even after deleted all cache and executed inside Private mode. HI,Could you please test again and in case you experience the same issue again please let me know the time of your request. Here is the time : 2:57 PM (Paris Time UTC+2). Infrastructure team is working on resolving this issue. We will inform you about the progress. the infrastructure team changed some settings for your account. Can you please test again. Sorry, for the inconvenience. I am getting the same issue reported by Joseph Berthe. When accessing the link to the IOT Services (https://iotcockpitiotservices-s0#########trial.hanatrial.ondemand.com/com.sap.iotservices.cockpit/) comes a dark grey screen with messages saying : “Could not load devices”, Could not load setting” and “Could not load data types”. And I have already cleared my Chrome cache as well. Even tried to use Firefox without success to fix it. Could you please check the trust settings of your account. You can see it in the HCP Cockpit > select your account > select Trust in the left menu. The option Principal Propagation should be enabled. If this is the case and your IoT Cockpit is still not working please contact me via email (see profile). Thank you. Thanks for the effort, but unfortunatly it still doesn’t works. Could you please contact me via email (see profile). I am using the trial account for HANA Cloud Platform. If I deploy the IoTMMS application, can I still deploy another JAVA application or does the IoTMMS application use up the single compute unit that HCP trial account comes with as default? you will automatically get a second compute unit after enabling the IoT Services. You can check by clicking on the “Resources” tab in the HCP cockpit. I can use the API for creating sensor data in my SAPUI5 WebIDE project, but if I follow the same approach for reading the tables (replace internal by api in the url and add the authentification header to the request), this will fail. I can do the request but the response is a logon html page. If I can remember correctly, this solved my problem. just a remark. This is a very important configuration step which makes it possible to use MMS Push API (to send data to the device). This example is not working for me. My iotservices has a MAXDB database and I want to use the WebIDE for UI5 not WebIDE for HANA. Please can you make a API available for reading the table. Thanks for your feedback. At the moment there are no plans to provide an additional consumption API but rely on the services (Persistence service, OData, XS etc) that are available in HCP already. For MaxDB, the best option would be to access the DB via JDBC and expose the respective service to your SAPUI5 application. I am trying to to send and receive messages via HTTP but it doesn’t work. could you send me your account name by email – then I can check the log files…. Do you know if this issue has this issue been resolved yet? I created a device ‘RaspberryPi_1’ and was trying to post messages to it via HTTP. I do get a 200 response. However, I don’t see any table corressponding to my device either. Please look at the screen-shot I have attached. I was checking this in MMS itself. And I still could not see my table. However, I closed the MMS cockpit and started it again. I could then see my DB table. Thanks for all your affort. I’m already stuck on one of the first steps: creating a device type. It always fails with a generic “could not create device type” error. When looking into the network traffic, the backend service is also not providing any detailed error message. I verified that the IoT-User role is assigned to my user in the IoT Cockpit service and that IoT-MMS-User is assigned in the IoT MMS app. Any idea what’s missing? Any help would be much appreciated. we will update you with the status once a problem is fixed. Sorry for the inconvenience. an issue if fixed now. You may model your device types, message types and devices. Thanks for reporting. Thanks Thomas!! I changed the authentication setting and now that issue is resolved. However I am now getting HTTP-500: Failed to forward a POST response from the destination to an origin. HTTP-500: Failed to forward a POST response from the destination to an origin. This means that you request could not be forwarded to MMS. It would be interesting to see what the IOException contains. Thanks a lot Thomas!! Now my Java application is working fine. 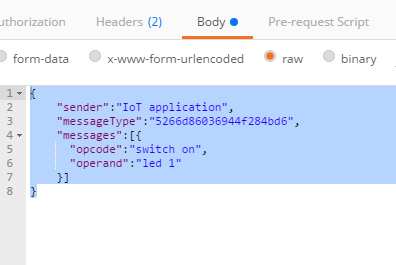 Next, I would like to test if the same IoT APIs can be consumed (GET/POST) from an HTML5 application. All I needed to do is to put the destinations iotmms and iotrdms on the account level and the application is working fine!! I have been able to test message sending via Send & Receive messages HTTP in HCP data services. However I am not able to send any data from outside … tried using HTTP Push services of Chrome Postman, Hurl it and even Python. Hi Abhishek, you are using ../v1/internal/.. endpoint in your example. Please use ../v1/api/.. instead protected with oauth. Thanks Anton a lot ..
Are there any code samples available for using this binary data type? Thank you. IoT Starter Kit will be extended soon. I would assume you are on Trial, right? Maybe some detailed message is there when you click on that tile? Or some output in browser console? Hi Anton and thanks for reply-ing. No on the detailed messages and no message in the console for both IE and crome. would you mind to share your HCP (p- / s- user) either in here or privately by sending a SCN message to me (you need to follow me for a while to do that)? I will then forward your issue internally. I have setup the IOT service and was able to send messages from the client on the cockpit. I can create message types and devices as well. I tried to post a message to a device and the data was sent to the IOT_HTTP_PUSH table. Now when i tried to receive this message through a HTTP GET call as described in the demo. I keep getting a HTTP 401 error. So in “Authentication Configuration” in the cockpit for my iot java application i enabled the different kinds of authentication. And yet i still receive the same error. I did ofcourse append user id and password in authorization for HTTP GET call. a minor remark first. If your MMS is of version 2.4 or higher then setting a “Custom” Authentication Configuration is not necessary anymore. That endpoint is protected with OAuth. Use your device token (Bearer: token) to authenticate and not the username:password (Basic u:p). I’m using IOTMMS on the Europe HCP (not the trial HCP), but still there is a limit for devices (50!). By creating devices via RDMS, I managed to squeeze in 67, but after that I always receive the error message, saying the limit is 50. Why is the limit there and how can I deactivate it? Unless you are asking for clarification/correction of some part of the Blog or Document, please create a new Discussion marked as a Question. The Comments section of a Blog (or Document) is not the right vehicle for asking questions as the results are not easily searchable. Once your issue is solved, a Discussion with the solution (and marked with Correct Answer) makes the results visible to others experiencing a similar problem. If a Blog or Document is related, put in a link to it in the Discussion. Read the Getting Started documents (link at the top right of each SCN page) including The SCN Rules of Engagement. I got a problem with deploying the Message Management Service. The deployment of the Message Management Service in the Internet of Things Cockpit is successfully, but the java app iotmms is very long in the starting mode and is on failed after a few minutes. I’m using IoTMMS on the Europe HCP (not the trail HCP). I am trying to run this demo but I came across a weird problem. 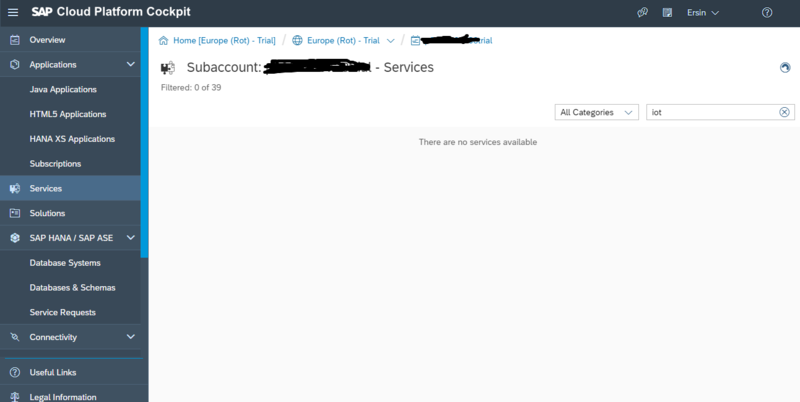 Problem occurs in HCP, with my trial account. There seems to be a problem when trying to access the service of IoT, within the Services available in HCP. Every time I try to access the service cockpit (“Go to service” link) I get 6 errors, such as “Could not load hierarchies”, “Could not load data types” etc. Any ideas about a solution? Is it possible send data from SAPUI5 application to device without use Java? I saw starter kit but just found consuming using UI5. Sending data from device to HCP is working well and i can consume it using OData API in UI5 application. Sending data from IoT cockpit to device is working very well too, but now, i would like to send data from my UI5 application. I tried the code bellow but didn’t work. I am sorry, i just copy and past the code here and forgot to change GET by POST. The correct code, using POST, i have been receiving response 403 using the code bellow. Another question now. Will the OAuth access token expire automatically? Is there any way the device receive it automatically or just manually? yes, Push Service API is protected with both Basic and Oauth authentication types. I would guess, when using Oauth you were getting HTTP 403 Forbidden, because the device token was used to authenticate. This is wrong. There is a separate procedure of requesting a token for Push Services like APIs. Please, follow the online documentation . P.S. Unless you are asking for clarification/correction of some part of the Blog Post, please create a new “Question”. The Comments section of a Blog is not the right vehicle for asking questions as the results are not easily searchable. Once your issue is solved, a “Question” with the “Accepted” answer makes the results visible to others experiencing a similar problem. If a Blog is related, put in a link to it in the “Question”. Please, read the “About SAP Community” and familiarise yourself with the “Community Rules of Engagements” . Where as IOT.pushData working without any issues. I have maintained the destination properly in HCP cockpit. in postman plugin POST call was successfull. Please advise where else the error would be. please familiarise yourself with the Rules of Engagements  and especially #9 – Do not create multiple copies of the same question in different threads. You have already asked the same question in here . Moreover, this particular blog does not describe Web IDE and Destinations setup. Instead of using IoT service cockpit, is there an API for creating message types, device types and registering devices? I signed up to the cloud platform and started a free trial, I want to use the iot service, but I can’t find the service when I look at the services.